When The Nerdy Show Network’s flagship podcast isn’t unloading on the latest geek news and happenings, we’re diving deep into super-specific discussions and interviews. 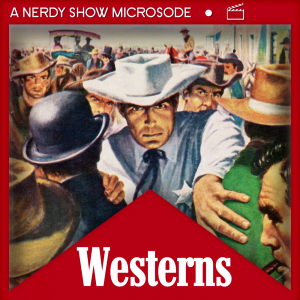 What makes a “Western”? Is it the arid landscape of 1800s America? Is it the hats? Or is it something more? …Some kind of “true grit”, if you will, that gets into the boots of a story and chafes at the characters’ collective psyches? In this listener-requested Microsode we might not be able to provide answers to the Big Questions in this Big Country, but we’ll certainly dole out as many musings as we can muster. Join Cap and 2/3rds of the Ghostbusters: Resurrection cast: Doug, Briggs, La Forge, and Poole for a rootin’ tootin’ travelogue through the world of Westerns. We’ve got advice on where to start if you want to dive into the genre, some off-kilter observations, and advice on what to watch in every era that spurs have hit the silver screen.